Connor’s Nubble is one of the easiest peaks you’ll bag in Acadia, except that it takes a long time to get to the trailhead. Even so, it’s not difficult hiking at all, as it’s the distance that will give you your exercise. And it has a surprisingly awesome view from the top, so this is one of those I definitely recommend. There are a couple of different ways to get there, but both are about the same. If you go from Bubble Pond, it’s shorter but a bit more complicated. Still, going from Bubble Pond also gives you a chance to do North and South Bubble at the same time, giving you three peaks in one shot. I almost always go via Eagle Lake, and that’s because I walk my dog out there a couple of times per month. Park at the Eagle Lake parking lot, either the one at the bridge or at the boat launch. From there, you’ll want to head on the right-hand side of the lake. It really doesn’t matter to be honest, but Connor’s Nubble is on the right side of the lake if heading south from the parking lots. Now, before you get to Connor’s Nubble you’ll come across the southern trail that goes along Eagle Lake’s southern edge. This hike is actually a very difficult hike despite having no elevation gain. It is difficult because of the large number of good-sized unbalanced boulders that are hard to scramble around without losing balance. Hiking Poles is recommended for this hike, which crosses right below Connor’s Nubble for a good portion of the hike. If you want to do Connor’s Nubble, we recommend skipping the Eagle Lake South Shore Trail (however, see below…). 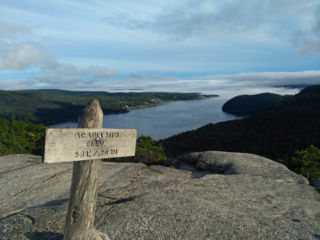 At some point you’ll arrive at the sign post that takes you either around Eagle Lake or to Jordan Pond. Stay on the Eagle Lake carriage trail to the left. After a few minutes of hiking from there, you’ll see the Connor’s Nubble trailhead on the left. Head up no more than 5-10 minutes to the summit. The summit itself doesn’t actually offer great views, but if you hike just a few seconds beyond the summit a very surprising view appears almost out of nowhere. One of the great things about this view is seeing the color difference between Eagle Lake and Frenchman’s Bay just beyond. It’s also a trick of the eye played by Mother Nature herself. That strip of land separating the two looks very thin, and almost hike-able. In fact it is hike-able (walking toward Paradise Hill and the Visitor’s Center), but it’s much wider than it appears, with a down-hill section that is out of view farther to the east. To head back, go down the same way you came up. Once on the carriage trail continue downhill to the left. At some point you’ll come to another trail head that goes toward the South Shore Trail on Eagle Lake, which I advised you to avoid farther up. However, at this point the difficult boulder-jumping is finished and this makes for a very nice walk along the southern shore. Either way, just finish by staying to the left until you’re back at the car. In total, this is a 2-3 hour hike that’s perfect for getting exercise without the elevation. To learn more, come stay with us. Check out our availability calendar at: www.miramonte.com. View of Sand Beach, Great Head, Schoodic Peninsula, and Old Soaker from Gorham Mountain. We went hiking at 5:30pm on a day in early September, and from trail marker to trail marker we had the mountain to ourselves. We saw no one until we got to the parking lot. 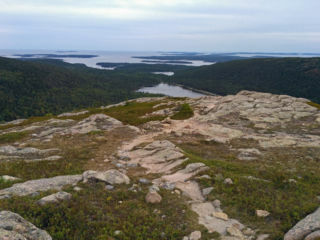 This is one of the fascinating aspects of Acadia National Park. It’s one of the smallest national parks in the country and at the same time one of the most visited, and yet it’s entirely possible to go to the busiest sections during peak season and get solitude. 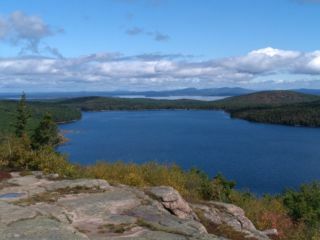 Gorham Mountain is a north-south mountain that runs parallel to the Ocean Drive, the latter of which is one of the busiest sections in the entire US national park system. It’s busy for a reason – it’s beautiful and iconic with Sand Beach, Great Head, Thunder Hole, and Otter Cliffs. The Beehive nearby is one of the most hiked hikes in the park, too. And Gorham is one of the easiest mountains to hike because it’s not tall and not steep, but there it is, with spectacular views and not nearly as many people on it as you’d expect. 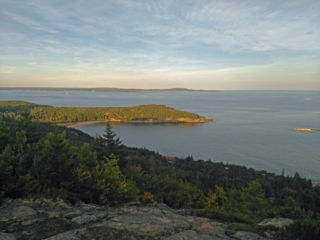 Beehive to Gorham to the Ocean Path: Park near Sand Beach, hike up the Beehive (steep ladders makes this thrilling to some, but it’s easier than it looks – still, not recommended for those who fear heights), down the Bowl Trail on the back of the Beehive, head over Gorham Mtn., then walk back to Sand Beach on the Ocean Path. This takes about 2.5 – 3.5 hours, depending on how busy the Beehive is. It’s physically easy to hike down the ladders of the Beehive, but because there can be so many people going up, going down would just get in the way. Don’t go down the ladder trail of the Beehive during the season. Gorham to the Ocean Path: This is the more popular route to take, and it’s a bit easier than the Beehive option because it doesn’t matter which side you park on. If Sand Beach is full, just drive all the way down to Thunder Hole or the Gorham Mtn. parking lot after Thunder Hole. It’s a loop, and an easy one at that, so just park, hike in one direction up, and head back in the other direction on the Ocean Path. Give this about a two-hour hike roundtrip without stopping much. During blueberry season, add another 1-3 hours depending on your appetite. Cadillac Cliffs: This is a WONDERFUL section for the kids. Located at the southern end of Gorham, it splits off the main trail and rejoins later on. One feels like one is walking through the land of giants. Kids with an imagination are going to love this section. We’re full of these types of tips because we do these hikes on our days off. Click our booking engine to reserve today and get more helpful tips at: www.miramonte.com.